A set is one of the key concepts of mathematics. The concept of the set is usually taken as one of the axiomatic concepts, that is, it can not be reduced to other concepts, and therefore has no definition. However, you can give a description of the set, as a collection of different elements, perceived as a whole. Venn diagram shows all the possible relationships between sets or events of a certain family. If element X belongs to a set M that is denoted by X ∈ M, and non-membership - X ∉ M. If the sets A and B are composed of the same elements, it is said that they are equal: A = B. Otherwise, the A and B sets are not equal (is denoted by A ≠ B). The set A is called a subset of the set B (denoted A ⊆ B), if every element of the set A is contained in the set B. In this case we also may say that B comprises the A or is a superset of A (denoted by B ⊇ A). The set A is called a proper subset of B (denoted A ⊂ B), if A ⊆ B and A ≠ B, i.e. B has elements that are not contained in A. A set containing a finite number of elements is called finite, otherwise - infinite. The number of elements of a finite set M is called its power. The set which doesn’t contain any elements is called empty (denoted by ∅). By definition, ∅ is equal to zero. It is believed that the empty set is a subset of any set. The basic operations on sets are union, intersection, difference and addition. Union of sets A and B (denoted by AUB) is a set of elements, each of which belongs to either A or B. Thus, a random element X ϵ АUВ if and only if either X ϵ A, and X ϵ B.
Intersection of sets A and B (denoted by A∩B) is the set consisting of all those and only those elements which belong to both set A and set B. Difference between the sets A and B (denoted by A B) is the set of all those and only those elements of A that are not contained in B. A logical complement of A (denoted Ā or ¬A) is the set of all those elements that do not belong to the set A. 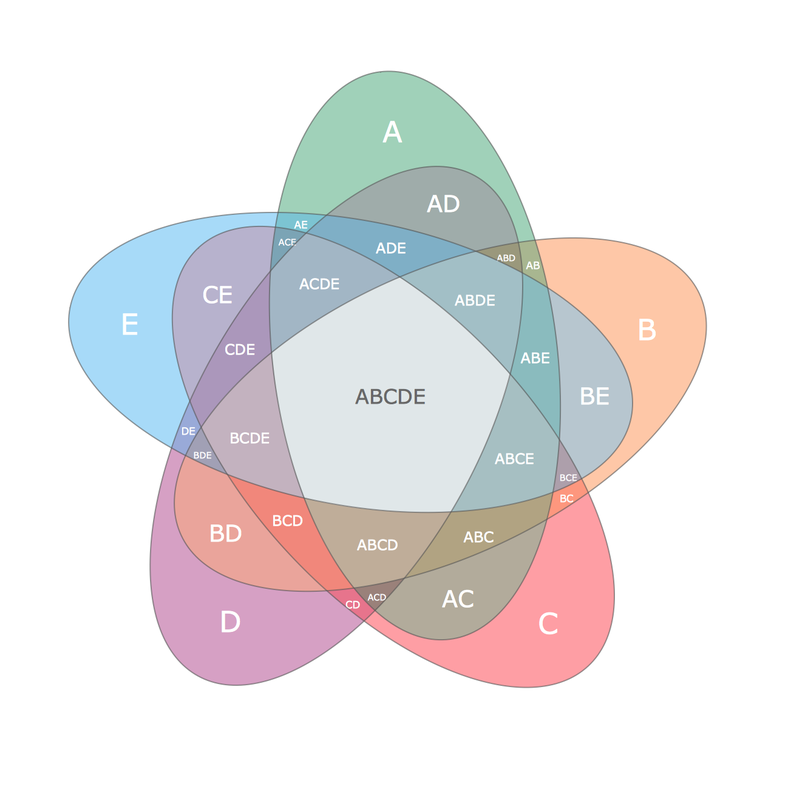 This example shows the radially-symmetrical 5 set Venn Diagram. The Venn Diagrams visualize all possible logical relations between several sets and are widely used in mathematics, logic, statistics, marketing, sociology, philosophy, etc.